Spray Foam Insulation is a product applied directly to walls, roofs, and floor joists that forms an insulated, air sealed barrier. 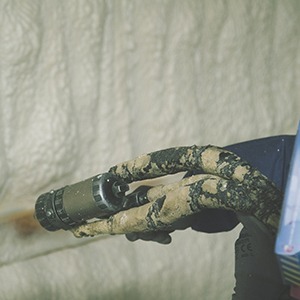 Spray Foam has the highest “R-value” of any type of insulation. R-Value measures insulation’s ability to resist heat traveling through it. The higher the R-Value, the better the insulation. As much as 40% of a building’s energy is lost due to air infiltration. Poor insulation and air leakage leads to high energy bills and makes your HVAC system work harder than it needs to. Over 50% of the energy used in a home goes to heating and cooling, so your HVAC system has a big effect on energy consumption. Insulation and HVAC systems go hand-in-hand. Spray foam insulation can help reduce the workload on your HVAC system thanks to its high R-value and effectiveness. The end result is a comfortable, energy-efficient home. By choosing Spray Foam over traditional fiberglass batting or cellulose insulation, you can save up to 40% on home heating and cooling costs. 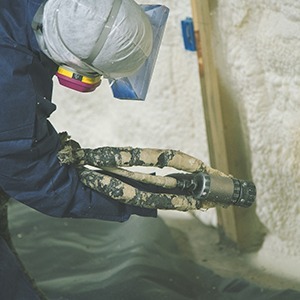 Spray Foam Insulation is a superior choice for anyone building a new home. Because of its high R-value, Spray Foam actually allows us to install smaller energy-saving HVAC systems, offsetting the initial cost of your insulation. With spray foam Insulation, HVAC sizing can be reduced as much as 35% without the loss of efficiency or comfort. Another benefit? Strength. 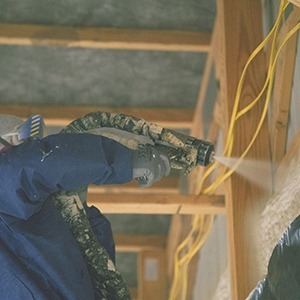 Spray foam Insulation adheres to the surface on which it is sprayed, forming a strong bond. This bond improves a new structure’s strength and durability. Air leaks waste energy and increase utility bills. Spray foam can be used to fill in gaps and stop air leakage throughout a home in areas like knee walls, attic hatches, wiring holes, open soffits, recessed lights, furnace flues, basement floor joists, crawl spaces, and around windows and doors. Call the Insulation Experts at RSP Heating and Cooling for more information or to schedule a free estimate.